Anxiety is a disorder where the sufferer is persistently and excessively worried about everyday things. Many different events, thoughts, or situations can trigger anxious feelings; for example, some people are terrified at the thought of being in a social situation, or some might have unfounded worries about the safety of family members. This chronic sense of fear can be mild to very severe and often has an impact on everyday life. Exercise is one way to help with the symptoms of anxiety. Exercise is a good way of dealing with anxiety, because on a physical level, it encourages the release of natural feel-good neurotransmitters in the brain, elevating mood. It also has psychological and social impacts that help with anxiety; for instance, the confidence gained from meeting a challenge or seeing improvement, and more social interaction. Adults are generally encouraged to do around 150 minutes of exercise each week, and the good news is that low-impact exercise - that is, exercise that does not put joints under stress - has been shown to be just as effective as high-impact activity (e.g., running). 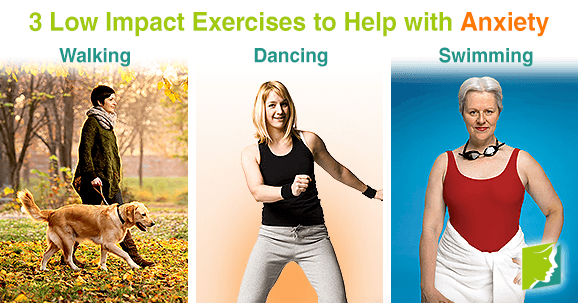 Read on for low-impact exercises that can help beat anxiety. This is a popular and cost-free form of low impact exercise that burns calories and works the cardiovascular system. It does need to be faster than a stroll; however, so try to walk fast enough to feel a difference in heartbeat and break a little bit of a sweat. Walking can be easily incorporated into everyday life without much effort; leave the car behind for short journeys, walk to work if possible, take the stairs instead of the elevator, or start going for a regular walk with a friend or coworker. Adding variety to your walks will also help keep you motivated, as will building up gradually; start with walking 10 minutes a day and gradually increase the length of walks, or choose a new and interesting place to go every time. As well as its positive effect on anxiety, regular walking reduces the risk of heart disease, diabetes, and asthma. Dancing is a fun and low-impact way to beat anxiety. Not only are you benefiting from the physical exercise itself, but the social nature of dancing and the visible achievement of learning a new skill can be a wonder for the condition. The good thing about dancing is that from ballet to street dance to salsa, there are so many styles that you are sure to find one for you. Experiment by going to different dance classes and trying them out for yourself, or start out just moving to your favorite tunes in your living room. Exercising in the water is a great way to go easy on the body while still benefiting from a cardiovascular workout and combating anxiety. It is also a flexible activity that can fit into your own routine and can be enjoyed by people of all abilities. Whether it's joining a class to learn how to swim, improving your existing skills, going to splash around and have fun with the family, or fitting in time to go alone as a regular fixture of your weekly schedule, all types of swimming are physically and psychologically beneficial - helping anxiety and your overall health. Far from being inferior to high-impact exercise regimes, low-impact activities can be just as effective at combating anxiety. This type of exercise can reduce long term damage to the ligaments and joints, and also means that anxiety sufferers for whom exercises such as running are not recommended (for example, pregnant women, older people, or people with joint or bone problems) can also get active and take steps to beat their anxiety.